I do my damnedest to not waste my time writing about poor quality brews but this time around I just couldn’t help myself, even if I only spent just under $7. I had never entered a Trader Joe’s until last month but I was in the neighborhood and figured I may as well check them out. After perusing the shelves for a few minutes I decided I really didn’t need anything in particular and made my way over to their liquor portion of the store. Where nothing particularly grabbed my attention aside from the fact that they sold all of their contracted beverages in either 6-packs or individually for the exact same price per bottle ( less one cent). Inspired by a recent post by my friend Stu of Friday Night Beer I decided I may as well spend a few dollars, set my prejudices aside and grab a mixed six-pack. In full disclosure, typically when I do a review I make sure I have a clean palate and never review more than one beer in a day without at least waiting many hours in between. In this case I consumed the 6 beverages over 3 days, more or less back to back. However I am more than confident in saying it did little to change my opinions on these brews and further I’m not sure if I could have brought myself to the last brew had I waited any longer. 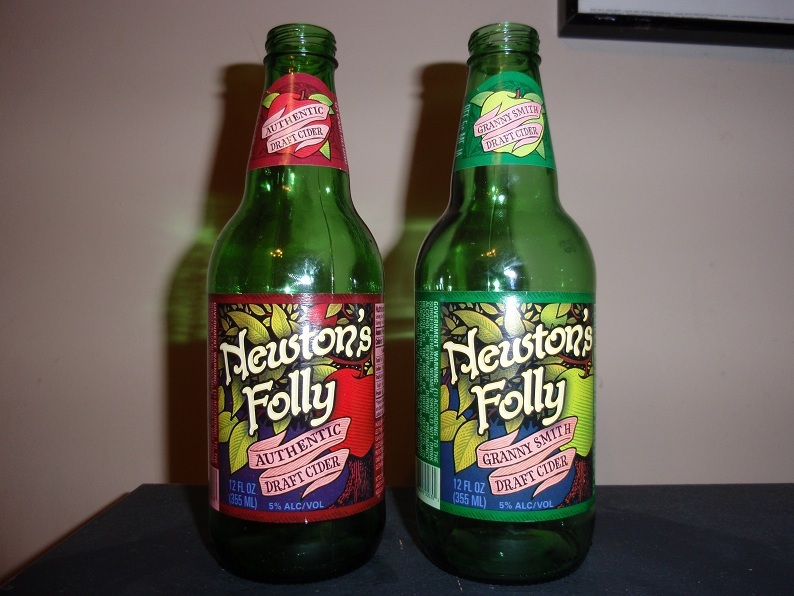 Of the beverages I purchased two of them were Ciders, both made by Newtons Folly so we’ll start there. Newtons Folly Authentic Draft Cider & Granny Smith Draft Cider: These two ciders are only getting one description as they barely differ. The Granny Smith tasted a bit more tart, crisp and perhaps a bit more natural…so I guess I preferred it a bit more, but it’s really hard to even care. Over all the flavor of both of these ciders is just about what you would expect from a contract cider produced by Woodchuck, because that’s exactly who makes it for Trader Joe’s. Tastes largely of apples and alcohol and is obviously mass a produced apple wine with very little character that is diluted and bottled. Body was light and mouthfeel was very carbonated. If you want your alcohol to taste like apples I guess you might dig it. But I would suggest some Crispin or Samuel Smith’s Organic Cider. $1 per bottle. 5% ABV. The first Beer that I consumed was JB (Josephs Brau) Dunkelweizen and unfortunately it was probably the best of the bunch. Though it has a fancy name and location scribed on the label it appears to be a simple contract brewing front for Trader Joe’s (or beer marketing company as I believe they like to be called). Color was a reasonably nice, very cloudy molasses hue. Sugary aroma with a small amount of malt richness. Has an interesting after taste of wheat that is quite noticeable but mostly tastes of slightly burnt adjuncts (sugar). Over all flavor is indistinct and modestly sweet with some gentle citrus esters that seem a bit out of place. Body is medium. Relatively to style but I would like to see the wheat come through better. Would be decent for a home brew but not overly impressive for a commercial beverage particular with the obvious amount of adjuncts used. If you like sweet beer you might enjoy it, though I can’t see myself paying for it again. $1 per bottle. 5.2% ABV. Mission St. Pale Ale: Produced by Steinhaus Brewing Company, another beer marketing company out of California. Completely translucent light copper hue. Surprisingly pungent hop aroma, very lemony and really no other dimensions; though over time I almost notice some orange esters. Almost no maltyness which is obviously out of style. Flavor is very lemon influenced with some uneventful pale malt notes that fail to add much. Lemon notes aren’t chemically but are overpowering and a bit artificial, seeming more like bottled lemon juice or perhaps lemon zest than hops. Very strange, very lemony. Not bad per seÂ but it was a bit difficult for me to drink as it was simply so lemony. If you really dig lemons I guess this is the beer for your. $1.17 per bottle. 4.6% ABV. Mission St. India Pale Ale: I had consumed this ale once before at my uncles over last Thanksgiving and remembered not hating it, but also not really remembering much about it so I figured I’d give it another chance. Pours an attractive medium amber hue that is very translucent. Smells of hop notes similar to their Pale Ale with serious lemon notes though additional citrus hop esters are present and provide a much more well rounded aroma that is far more enjoyable, but still rather boring and a bit acidic with modest bitterness to somewhat round it off. Flavor is quite bitter which I rather enjoy but the citrus and floral esters are a bit muddled and not overly enjoyable. An OK ale provided you don’t mind bitterness. $1.17 per bottle. 6.1% ABV. Kennebunkport IPA: This ale is apparently part of the Federal Jack’s “family” of beers and I will simply say I really hope it doesn’t reflect upon the quality of the other beers in their family because this brew was simply awful. Color is a slightly reddish copper hue that is completely translucent. Initially smelling almost only of malt with some odd esters that remind me of burnt caramel, though if you can get over that unpleasantness there are some flat citrus and floral notes that are also unenjoyable in my opinion. 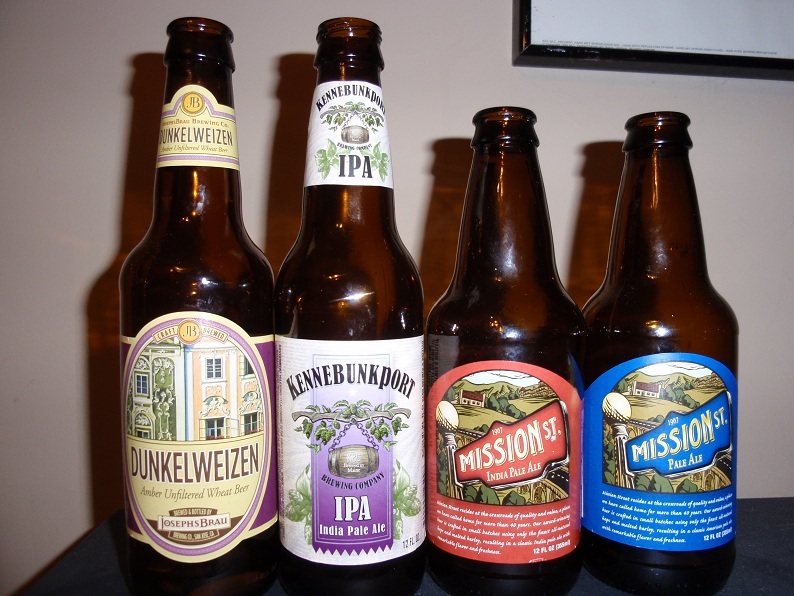 Flavor is mostly of unpleasant malt notes similar to the aroma and a modest amount of unpleasant citrus notes that are predominately lemony but at least more varied than the Mission St. Pale Ale. Some hop bitterness, a variety of off flavors and more alcohol than one would expect. Frankly I found this beer completely undesirable and very hard to drink, I almost poured it out. Unless you like torture don’t do it. $1 per bottle. 6% ABV. I will admit that Trader Joe’s has some interesting and unique food products for sale, but I can not rightly encourage anyone to bother with their beer selection. Though I suppose I would take most of them over a bud, but only a couple over a Grain Belt Premium. They say they offer refunds on products you do not like so perhaps if they honor this I may try some more for the hell of it. Drink some better beer and ride your bike.